I’m not usually a huge sports fan, but I do really enjoy the World Cup every four years. Even though we’re waiting for the next installment of the world’s biggest soccer tournament, I got a little World Cup fever the other day and decided to look for a good browser-based soccer game, if such a thing exists, to tide me over. Fortunately, I found Power Soccer, a browser-based soccer game with an ambitious set of features. This game allows you to join leagues and play with other players from all over the world in multiplayer matches. With thousands of users online most of the time, I had no problem finding opponents and quickly getting into matches. In the game, you pick your World Cup team of choice to take on the competition with. 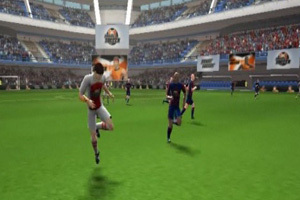 Then, you are quickly taken to the game and immersed in the action thanks to the game’s surprisingly attractive graphics. The camera gives you a wide view of the action, which is important for setting up your tactics. Instant replays let you enjoy great plays or view bone-cracking fouls after the fact. In between games, you can check out statistics and other features if you are in a league. There is even a career mode, where you can play different campaigns such as the “Stockholm Soccer Open” while trying to collect stars and clear locations. Whether you are setting your tactics to take advantage of the other team’s flaws or just enjoying the action as a casual player, I think Power Soccer is one of the better browser-based sports games out there. I enjoyed my time playing it and avid soccer fans should like it even more.